Our holiday home is in a superb location in Paihia with spectacular sea views overlooking one of Paihia's most popular swimming beaches. It is only a few minutes walk along the waterfront to the village and a great selection of shops, cafes and restaurants although guests usually prefer to dine on the deck and enjoy the outdoor furniture, superior bbq, electric awning and stunning views! The split level home is elevated quiet and private. It contains two bedrooms that are well separated and in the second bedroom you can choose to have either twin singles or a super king. There is a fully equipped kitchen with walk in pantry, a spacious lounge with leather settees and breathtaking views of the Bay or native bush from all areas of the house. ALL LINEN AND TOWELS ARE PROVIDED. This house is perfect for two couples, or a family of up to five where the double sofa bed can be used in the lounge. Extras include two kayaks, Sky TV (with movie and sport channels! ), WiFi broadband, CD and a selection of novels, games and puzzles. 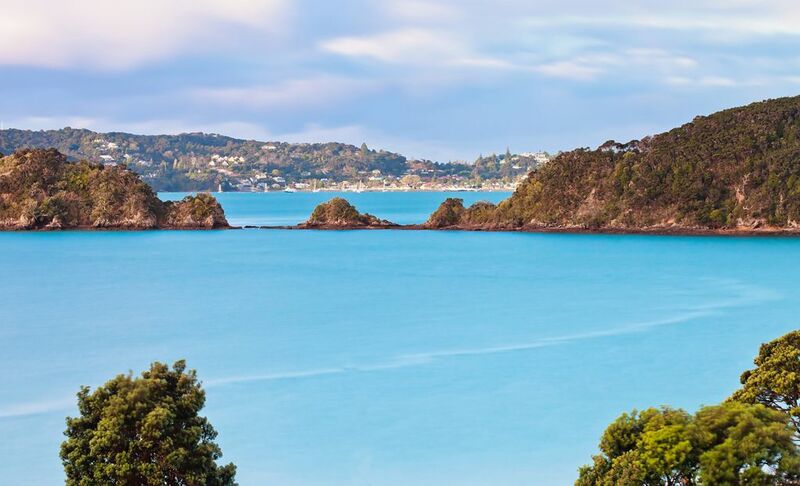 These will help to make your Bay Of Islands holiday a very memorable one. "Superb ! One of the best summer holidays my family of four has ever had. House was spotless, fully equipped (including wifi for the teenagers) and the location was perfect. Being elevated, you get great views from the deck and it's a very easy walk to the beach. As visiting South Islanders, we parked up here for 12 days and explored the whole Top of the North. Spectacular - we loved it. Our hosts friendly, helpful and 'invisible'. Cannot recommend highly enough. We will be back. "What a wonderful house - we thoroughly enjoyed our stay. The view is lovely and the atmosphere totally relaxing. The deck and the BBQ has been much used." Janet and family from England. Go to sleep with the relaxing sound of waves breaking on the beach and wake up to birds singing. We really loved our stay in Paihia. The house was immaculate, spacious, well appointed, good location, but the amazing view takes it to another level. So beautiful to wake up to each day and enjoy a morning coffee on the deck. This was a beautiful home and our hosts had really thought of everything. We particularly enjoyed using the sea kayaks. Sehr großes, modernes Anwesen mit tollen Gastgebern und einer unglaublichen Aussicht. Eine der besten Unterkünfte, die wir während unserer Neuseeland-Rundreise hatten. Zum Strand sind es nur 1-2 Minuten zu Fuß und wer möchte, darf sich die Kayaks der Gastgeber kostenfrei leihen und so die Bay ausgiebig erkunden. Einkaufsmöglichkeiten sind auch ohne Auto erreichbar. Ein Parkplatz ist direkt am Haus gelegen. Auf dem Balkon kann man gemütlich bei einem Grillabend entspannen und den sagenhaften Ausblick auf das Meer genießen. Wir können diese Unterkunft uneingeschränkt empfehlen und bedanken uns bei Kay und Wayne für die warmherzige Gastfreundschaft. This property is truly exceptional in every way. The home is the cleanest in which I have ever stayed, spacious, cozy, well stocked. the beds are comfortable, and the view is breathtaking. Sitting on the deck and staring into the blue waters of the South Pacific was wondrous. Owners Kay and Wayne were both gracious and helpful. A truly wonderful stay. Highly, highly recommended!!! Had an amazing time at this property in Paihia. The property was well presented and had everything we needed - including amazing views out into the bay. The hosts were excellent as well. Very friendly and gave you the space you needed. Highly recommended. This is a five stare plus home. Loved everything about it!! Will come back for sure!